Did I see Elvis? If I did, thankfully it wasn’t him and grandma welcoming me into the light. Know me, and you know I thrive on old rock and roll music in general and anything about “The King of Rock and Roll” in particular. “Did you see him in person,” someone always asks. For many years, the short answer was, “No.” But, that’s where this story begins. Before moving to Mount Pleasant during my grade school years, the last career stop for my dad was in the small West Texas community of Seymour—a dusty spot at that time where everything was within walking distance. Walking to a country music show at the high school gym one night was exactly what the teenage daughter of a family friend had in mind. Only after agreeing to let a couple of younger kids tag along did her parents consent to allowing her and a girlfriend to attend. I suspect that was to dampen any plan for meeting boys, but it worked—and I was one of the tag along kids. Childhood recollections of the night were pretty much limited to a late night, loud music, some guy in brightly colored clothes singing, and the weirdest thing—every girl in the crowd going insane. There were also doses of stern parental lectures afterward regarding trust, responsibility, not coming home on time, and other similar parental sermons many have heard … and given. Fast forward to 2003 and on the phone is Ernst Jorgensen, a record executive whose life work has been documenting Elvis’s image by re-mastering songs and publishing books about “The King’s” career. “Suddenly a girl at the edge of the stage … screamed, ‘He’s here! He’s here!’” Dixon described guitar player Scotty Moore and other band members (drummer D.J. Fontana and bass player Bill Black) taking their places before Elvis walked on the stage. “He was wearing a fire engine red sport coat, bow tie, white shirt and blue trousers, Dixon wrote. “Both coat and trousers were two sizes too large, so he could make his moves without ripping something. For a long moment, he stood there with half-closed eyelids, not saying a word. Scotty stepped up behind Elvis and pretended to wind him up as one winds a wind-up toy. 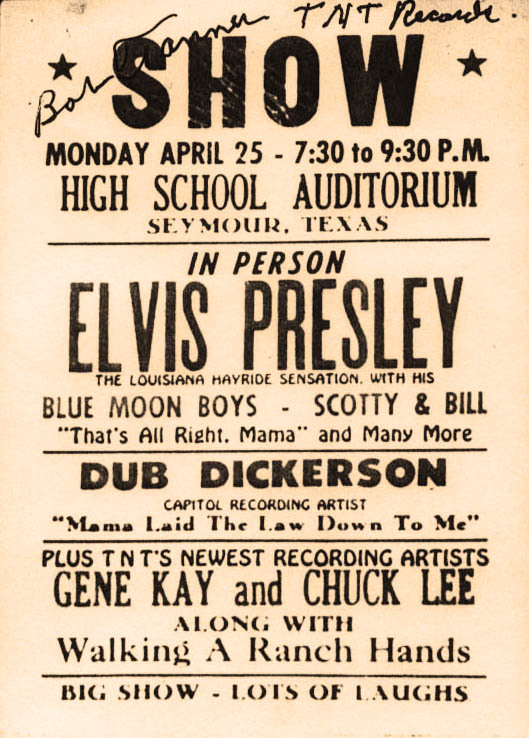 With this done, Elvis suddenly grabbed his guitar and broke into ‘That’s All Right Mama’ … and the show was on. Elvis reportedly asked for a long intermission in Wichita Falls allowing time for a quick appearance in Seymour. The problem was compounded, according to Elvis, when they ran out of gas just outside Seymour and had to hitchhike into town.